So here’s the other thief of my time that I didn’t even see coming. When May and I were planning our girls weekend we picked two movies (not that we ever finish watching anything since we always fall asleep). Per her suggestion we rented Nights in Rodanthe and Twilight(I know what you’re thinking but we thought why not, just for fun). Next thing I knew I couldn’t wait to get home after dropping May off at the airport on Monday to start reading the books. We actually enjoyed the movie. It was so bad it was good. And I haven’t read a book, actually turned the pages of a book in about 3 years. I listen to books all the time but I don’t “read” them. I’ve already finished the first one, Twilight and I’ve started the second, New Moon. Somebody stop me please. This is not literature it’s fluff but such good fluff. A part of me is actually feeling guilty too since I’m a devout Anne Rice fan. I mean, does it get any better than Lestat. No, not really. 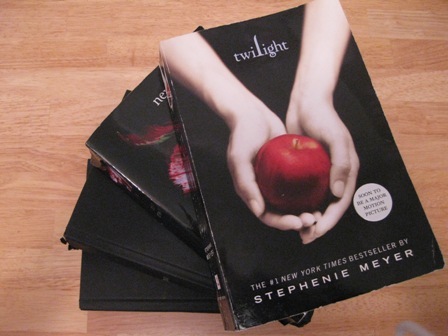 These Twilight books are like a train wreck I just can’t take my eyes off of. Another friend just happened to give me the books (weeks ago) on a whim, suggesting them as a good, mindless summer read. How convenient…..before the movie I had no intention of even touching them. on July 27, 2009 at 3:02 am | Reply Kim D.
So glad you’ve come over to the Dark “Twilight” Side. I was the same when I started reading them. Wonderful literature they are not, but excellent entertainment. Loved them. Hey, as a woman who runs a literary arts organization, may I just say that I devoured all four in the series, with no shame at all! ENJOY them! Everybody needs a little brain candy once in a while but let me remind you… Real vamps don’t sparkle! I haven’t read them myself but I’m more a “True Blood” fan. I can completely relate – I got sucked in by the movie and just finished listening to Twilight on audiobook. I’m on the waitlist for the New Moon audiobook and have already uploaded Eclipse. I’m obsessed and not ashamed in any way!! !